June 19 marked my one year work anniversary here at the VPA! As with all anniversaries it prompted me to reflect on the past twelve months. It’s been an action packed and very productive year. I continue to e greatly honoured to be working with such capable people and working with all of our stakeholders to help unlock quality urban growth across Victoria. The VPA is proud to have facilitated the second GAIC works-in-kind agreement, which will result in Mirvac providing the state government with 3.5 hectares of land for a new primary school in lieu of paying GAIC. The agreement supports the delivery of the Rockbank North Precinct Structure Plan, which was approved in 2012. Since the PSP was approved in 2012 almost 1700 residents have moved into the new suburb, which will be home to more than 20,000 people once fully developed. As more people decide to call the Woodlea estate home, it is important local infrastructure is delivered in a timely fashion, and agreements like this one will help make that a reality. This is the second GAIC works-in-kind agreement reached in Victoria and it paves the way for more of these agreements in future. 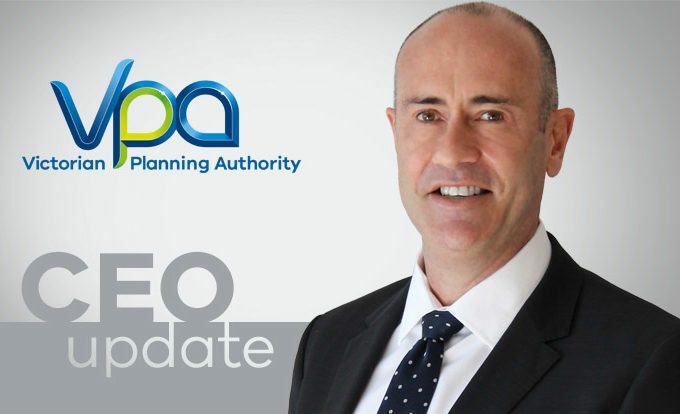 The first round of funding applications for the 2018/19 Streamlining for Growth Program recently closed,with the VPA receiving $9 million worth of applications – a record amount. This is the third year the program has been running and it has funded a diverse range of planning projects across Victoria, with funding increasing steadily over the life of the program. As you may be aware, the program was awarded an additional $3.5 million in this year’s State Budget to cut red tape and boost council resources in Melbourne’s greenfields. The total budget for the program is now $24 million over four years. The VPA will now assess all applications and will shortly announce the successful projects. As many of you will be aware, there has recently been significant changes to the infrastructure contributions plan system. The Public Land Contributions Act 2018 was proclaimed on 2 July, with three interim ICPs for Donnybrook, Woodstock and Mt Atkinson & Tarneit Plains being gazetted, to enable permits to be issued pending permanent replacement ICPs. On 26 June the VPA and DELWP hosted a UDIA industry forum about the new system, to ensure industry was across the details of what these changes will mean to industry. The VPA is continuing to work through the process to complete final ICPs as soon as possible. Invitations have been sent to stakeholders to convene an ICP implementation review working group to monitor issues that may arise from the new system. The VPA, DELWP and Glen Eira City Council recently held a community visioning workshop for the Caulfield Station Precinct, which was attended by 170 people.This was a fantastic opportunity to learn more about people’s ideas for the area, to inform a structure plan that is being prepared. The precinct consists of 122 hectares of land bounded by Kambrook Road, Queens Avenue, Dandenong Road and Neerim Road. It is just 10km from the CBD on a major transport corridor, with a booming student population and an expanding Monash University campus. The precinct also takes in the Caulfield Racecourse Reserve, a 54-hectare reserve originally set aside in 1879 for racing, recreation and a public park. The Minister for Energy, Environment and Climate Change recently established a new Trust to manage the reserve, following recommendations from the Victorian Auditor-General’s Office to improve public access to the land. The outcomes of this phase of community consultation will be shared with the Trust to inform their future planning for the reserve. The Victorian Planning Authority (VPA), in partnership with Brimbank City Council and state government agencies, has released a draft plan to guide development within the Sunshine, Health, Wellbeing & Education Precinct. The precinct includes approximately 67 hectares of land in St Albans, centred on the Sunshine Hospital including the Joan Kirner Women’s and Children’s Hospital.The draft plan has been informed by background technical studies prepared in consultation with council and state government agencies and with input from a Strategic Plan Reference group. It proposed the area will be rezoned to Comprehensive Development Zone, with development to be generally in accordance with a Comprehensive Development Plan. It is envisioned that by 2051, the precinct will support more than 7,200 jobs in a welcoming and professional environment anchored by established key health and education institutions. Complementary uses such as allied medical services, commercial uses, housing, retail, open space and community facilities will be integrated into the precinct to accommodate the diverse needs of workers, residents, visitors and students. On 30 May the VPA partnered with the City of Whittlesea and Mirvac to host a forum on collaborative social planning outcomes for outer Melbourne. The event was attended by 120 people, including state and council planners, community development professionals, developers and representatives from health and human service organisations. Speakers explored practical examples of best-practice community engagement and community development. In particular, VPA Executive Director of Outer Melbourne, Alix Rhodes, discussed the ways in which the Growth Areas Social Planning Tool can help planners and developers ensure that communities have access to the right services and infrastructure at the right time. Alix demonstrated how the tool aligns with the Precinct Structure Plan (PSP) process and showcased the tool in action at Casey council’s Selandra Rise.